The shop is located at 1014 Lincoln Street on the edge of Little Italy in Wilmington, Delaware. This neighborhood has a history of great small company and family restaurants that gave a sense of pride to the area and the Post strives to bring that feeling back with a new generation of food forward business owners. All the owners have been raised in Wilmington, in various neighborhoods in the city, and are all looking forward to cooking for, and serving all the friends and family they have in the area as well as giving people from other areas a reason to come check out the neighborhood. The company began as Wilmington Pickling Company, which was founded by Chef Daniel Sheridan in 2012. The pickles, which started as a hobby on off days, soon began to pick up momentum after becoming available in area grocers such as Jansens and as the official sandwich pickles at restaurants such as Buckleys in Centerville. Fueled by the support and love of the company, Daniel decided to take a jump and try to figure out how to make pickles a full time opportunity. While looking for a space to produce pickles out of, 1014 Lincoln was stumbled upon, and the vision for Locale BBQ Post was almost immediate. BBQ and pickles are a natural combination and it made sense to blend the two out of the location on Lincoln. The goal was to keep producing the pickles that gave a start to the vision and to add on a menu of BBQ that people will recognize and appreciate. Daniel found two other partners in Mike Gallucio and Justin Mason through friends in the neighborhood and the three pushed forward and made the Post happen. The menu is meant to be small and controlled so that the highest standard can be upheld to every item. The use of local farms will be something the company strives for whenever possible throughout the menu. 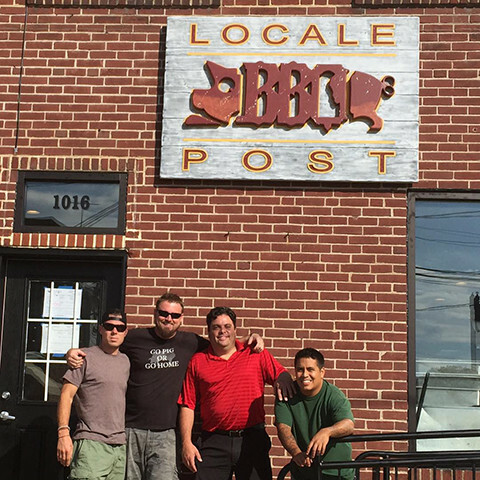 Locale BBQ Post is not trying to reinvent the wheel of BBQ but instead give their own spin and flavors on a long tradition of feeding family and friends with slow cooked greatness.